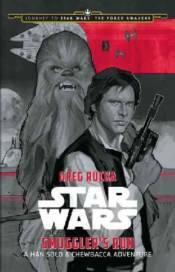 Han Solo and Chewbacca the Wookiee team-up for an all-new adventure in this thrilling upper middle grade novel. Set between Star Wars: A New Hope and Star Wars: The Empire Strikes Back, the story follows everyone's favorite pair of smugglers as they fly the Millennium Falcon on a top-secret mission for the Rebellion. Hidden in the story are also hints and clues about the upcoming film, Star Wars: The Force Awakens, making this a must-read for fans old and new!